Automated Micro-Needling or Collagen Induction Therapy ( CIT) is naturally induced skin rejuvenation and is an excellent new innovation which is used to treat fine lines and wrinkles, acne scars and improve the skin’s overall appearance. Skin needling, also called microneedling therapy, is a minimally invasive skin-rejuvenation procedure that triggers the body to produce collagen and elastin. Through the process of neovascularization and neocollagenesis, there is improvement in skin texture and firmness, as well as reduction in scars, pore size, and stretch marks. Micro-channels created by the treatment allow for optimal absorption of topical products and Platelet Rich Plasma (PRP), enhancing their effects in the deeper layers of skin. First, about 2 teaspoons of blood are drawn. (hence the name Vampire Face Lift has been used to describe similar procedures). Using a centrifuge, platlets are isolated from the blood (platelet-rich plasma or PRP) containing growth factors that her body would normally use to heal damaged tissue. “Activated”platelets release growth factors that would normally be used to heal injured tissue. PRP can also be used topically directly after micro-needling. Micro-channels created by micro-needling provide a direct pathway deep into skin layers of skin for optimal effect and skin rejuvenation. Micro-needling with PRP application is ideal for smoothing fine lines, wrinkles, scars and increasing plumpness and overall skin rejuvenation. – MicroGlide GF uses human bone marrow derived mesenchymal stem cell growth factor (GF) to optimize the skin’s response to the Eclipse MicroPen procedure. The MicroPen can provide results for improving the appearances of acne scars. 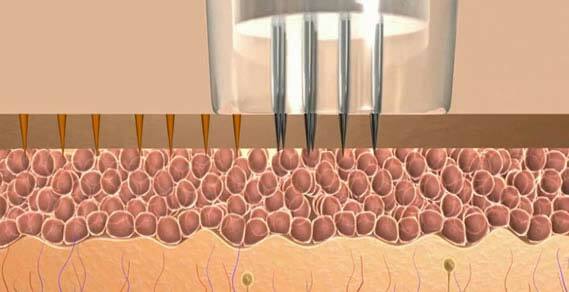 The physical nature of “skin-needling” breaks up fibrous and uneven scar tissue and encourages growth of new tissue. Currently there are ablative (creating a wound to incite healing) and non-ablative treatments offered, which can damage the epidermis and evaporate the skin leading to thinner epidermis problems. 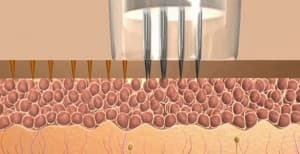 Converesly, MicroPen maintains the full integrity of the epidermis fully intact, quickening healing time and causes less pain. Interested in MicroPen Micro Needling? Contact Us Today for a Free Consultation!